Robin Rue Simmons speaks at a forum she attended on Jan. 19 with the other candidates for 5th Ward alderman, mayor and city clerk. Simmons was endorsed on Thursday by Ald. Delores Holmes (5th). Ald. Delores Holmes (5th) announced her endorsement of Robin Rue Simmons, a candidate for 5th Ward alderman, on Thursday. Holmes, who is not running for reelection, said she decided to endorse Simmons after listening to all five candidates for the position present their policy ideas in a series of forums over the past few weeks. In a statement addressed to residents of the 5th Ward, Holmes praised Simmons’ preparedness. Holmes told The Daily that she was impressed with Simmons’ regular attendance at ward and council meetings, as well as her work with Sunshine Enterprises, an organization that provides training in business management and development to local entrepreneurs. She added that Simmons had come to her for advice when she first announced her run. Simmons views Holmes’ endorsement as the most important one she will get during her campaign. Simmons added that if elected, she will continue to look to Holmes as a resource and adviser, leaning on her many years of experience as an alderman. Her focus as alderman would be to increase jobs and small business support in the ward, Simmons said, as well as redistributing funds for affordable housing support to increase homeownership. There are four other candidates running against Simmons for the position of alderman: Misty Witenberg, Carlis Sutton, Carolyn Murray and Daniel Featherson. Several candidates are focusing their platforms on affordable housing and economic development in the ward. Witenberg said she would center her work on providing social mobility for working families, prioritizing policies to ensure family stability and help single parents. “There are so many tradeoffs that families are making all the time, and I want to make sure that I’m giving city leaders and Evanston at large a real opportunity to understand them,” Witenberg said. The program, which Murray used to buy her first house when she moved back to Evanston, was designed to help individuals purchase their first house in Evanston. 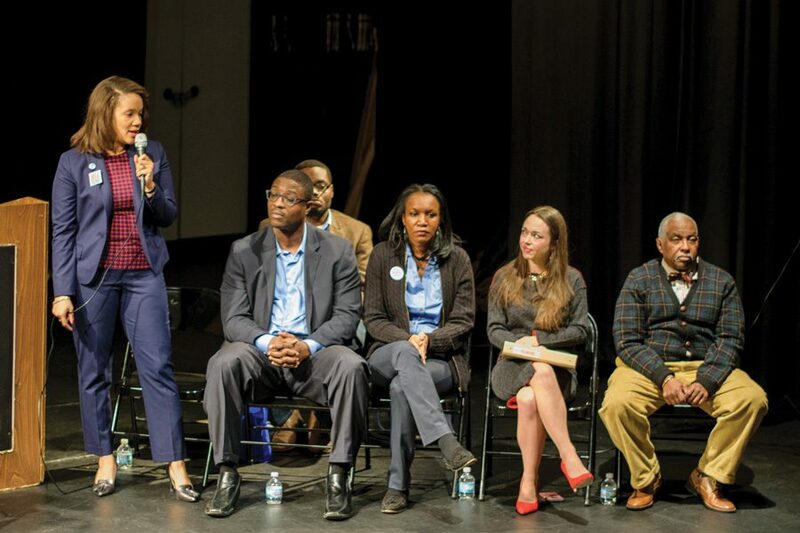 At the same forum, other 5th Ward candidates spoke about raising the minimum wage in Evanston to help with economic development and housing. “More people would be able to live in Evanston if they had a ‘liveable wage’ to afford higher rents,” Sutton said. He added that his concerns lie with rising rent prices, and he thinks higher wages would be able to combat this issue. Echoing the other candidates’ calls for investment into the Ward, Featherson said he would use his experience in real estate to bolster investment in the ward and its residents. Residents will vote for 5th Ward candidates on Feb. 28. If no candidate reaches more than 51 percent of the vote, the top two will move on to the general election in April.